It was Maha Pajapati Gotami, the Buddha’s step mother and aunt who received this heritage directly from the Buddha. She was praised by the Buddha for being Rattannu (long standing) to start the bhikkhuni lineage. The Buddha established four groups of Buddhists: bhikkhus, bhikkhunis, laymen and laywomen. With this establishment he expected them to study his teaching, put it into practice and last but not the least, should there be any misunderstanding from outsiders, these four groups of Buddhists must be able to defend it and make the right statement. Bhikkhus and bhikkhunis lasted up to 11th C.AD. both disappeared after the invasion of Turk Muslims who invaded India during that time. With their shaved heads and bright saffron robes they were outstanding targets, hence none of them survived. In recent years there are now attempt to bring about the bhikkhu sangha in India but this is only sporadic, very few native Indians who have joined the Sangha. In the 3rd C.B.C. we have record of the bhikkhuni lineage which went to Sri Lanka under the leadership of Princess Sanghamitta, King Asoka’s daughter and the bhikkhuni sangha to establish, for the first time, bhikkhuni lineage outside India. It was this heritage that continued and spread to China in 433 A.D.1 The Chinese Bhikkhuni Order started with 300 committed nuns and from that time on, they prospered up to present. An interesting biography of the Chinese Bhikkhunis recorded by the Monk Pao Sheng is an evident that they were very successful. Reading through their biographies one cannot help but admire the strong faith that these Chinese bhikkhunis expressed in their commitment and sincerity. With the turn of the new millennium the media reports more about ordination of Buddhist women in various traditions. It is true also with the Roman Catholic ordination for women which started to come on strongly with the ordination on the Danube in 2002. In this paper the author will attempt to give a survey of the actual ordination and look at some of the obstacles Buddhist women in different countries have faced trying to keep the heritage they have received from the Buddha alive. Geographically, the paper will limit the discussion only in the Buddhist countries where ordination of women is still problematic. Countries like Korea, China, Taiwan, Singapore etc. Bhikkhunis are already prosperous and doing their work with the shared responsibility with their brother-bhikkhus. A study of the work how these bhikkhunis have conducted themselves would also be needed for a complete understanding of the issue, however, for the limitation of time, it is not included in this present paper. With its geographical limitation, the fully ordained bhikkhunis apparently never reached Tibet. In spite of the fact that it is very popular for Tibetan families to give at least one son for ordination, the daughters did not share the same honor. Instead they have to remain behind taking care of the family and household chores. However, there are samaneris (Pali) or samanerikas (Sanskrit). Since 1959 When H.H. the Dalai Lama fled from his home land and eventually settled in Dharamsala, India Tibetan Buddhism has become very popular in the west. Partly due to the charismatic personality of H.H. the Dalai Lama, Western people have been greatly drawn to Tibetan Buddhism. Among the new Buddhists there have been noticeable pockets of western women who have taken the robe and lead the life of monastics. But as Tibetan Buddhism could provide only lower ordination, some of these women found themselves seeking full ordination to become bhikkhunis in Chinese or Korean tradition. The Chinese ordination tradition is obtained both from Hong Kong and Taiwan. But with their closer connection with their root teachers which are usually Tibetan lamas, these women after having received full ordination from Chinese tradition still kept their Tibetan robe and followed their Tibetan lineage both spiritually and ritualistically. This practice would not be accepted in Thailand. The sangha would insist that you wear the robe of your tradition. But I do not see such reaction from the Tibetan sangha. This is quite a liberal attitude to be thankful to the Tibetan Sangha. I brought the issue of ordination for women to H.H. the Dalai Lama as early as 1981 when I first met him in Dharamsala. At that time he suggested that I sent my existing research on the bhikkhunis to his office so that they will not have to start from scratch. This I did but did not have any follow up on the issue. I personally met H.H.the Dalai Lama again in NY in Sept.2005. He reassured me that the issue is under research. He wanted to have all the monks to agree upon. I was sadden, and disappointed. The gap was 25 years and we are still researching! To wait for all the monks to agree upon the issue, presupposes the re-education of the monks textually and spiritually. That will not happen in this life time. I have absolute faith in the true spirit of Buddhism in the embodiment of H.H. the Dalai Lama the 14th and hope that the change will come about for women to walk this path, the short cut as the Buddha said. I trust that the change is possible with H.H. as the one holding the flag of no-fear. The Tibetan Sangha has gone through lots of changes, while they are still in a transition period, to accept certain change and improvement for the betterment of Buddhism would be easier appreciated and accepted. The move will have to come from H.H.the Dalai Lama who has the encompassing compassion for both men and women, for both the bhikkhu sangha and the bhikkhuni sangha. At present there are western women in Tibetan Lineage who have received full ordination from the Chinese tradition, some of them have already completed their twelve years standing as bhikkhunis and should be ready to form the chapter of the necessary minimum five bhikkhunis to hand down the ordination. The Western bhikkhunis who follow Tibetan lineage is quite capable and already have long standing as bhikkhuni teachers. 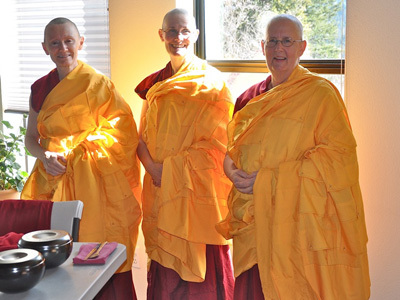 To name a few, Venerable Bhikkhuni Tenzin Palmo (English), Venerable Bhikkhuni Jampa Tsedron (Germany), Venerable Bhikkhuni Karma Lekshe Tsomo (U.S.A.) there is also another senior bhikkhuni teacher at Gampo Abbey in Canada, etc. These are the two possible alternatives for the Tibetan Sangha if they want to establish the bhikkhuni sangha as established by the Buddha. It is their responsibility to fulfill what is lacking as an expression of respect to the Buddha. These two countries follow very closely to Thailand. In Cambodia, the present Sangha came into existence only after 1979. There are two sects, the Dhammayut and the Mahanikaya. Somdech Buakree of the Dhammayut received the ordination lineage from Thailand. During the difficult time, he stayed in France and returned only when Cambodia returned to peace again. Other Senior monk like Somdech Mahaghosananda survived the difficult time living in Thailand, later he found his own community in Providence in the US. The Existing Somdech, Debvong, was ordained only in 1979 he is much of a puppet to the Cambodian government. Most monks in Cambodia are younger generation ordained after 1979 so the donchees (white robe, 8-precept nuns) seems to have more understanding of Buddhism. Having survived the war, many lost their husbands and sons, carried deep scars with them. With this hardship experienced in life, they were bolder in expressing their desire for ordination. However, with lack of education and training, there are no suitable leaders among them. Heinrich Boll Foundation from Germany is doing a great work to try to strengthen them by helping and supporting an association to provide training for both the donchees and laywomen. In Thailand, Buddhasavika Foundation conducts a regular 3-month training for lay and monastics. Her Majesty Queen Monique, the Cambodian Queen supported five donchees to come to Thailand for training. For the past three years 2002-2004, a group of five donchees were invited to come for 3-month training in Thailand. The present King also seems to be supportive and Somdech Buakree once said to the author that if the Cambodian women are ready, he is willing to build a temple for the bhikkhunis for them. Considering positive changes in Cambodia, the ordination of women is possible in the future. Laos came from the same stock of people as in Thailand. Culturally the Laos follow closely behind the Thais. In this context, I would believe that the changes in Thailand would effect Laos automatically. This goes without saying that the movement of ordination for women in Thailand will eventually be accepted by the Laos community. But in Laos it may take much longer with the limitation and accessibility of education both general education and Buddhist education among the Laotians. Myanmar is one country that the ordination of women will come last if it is going to take place at all. This is because of the military government coupled with the highly patriarchal system within the Sangha itself. Myanmar Sangha pride themselves for being the true Theravada country, and some of the monks are very possessive of being Theravada to the point of forgetting about Buddhism. In the past history, the monk who gave ordination to bhikkhuni was forced to disrobed. And recently this year (2005), Saccavadi, a young bhikkhuni ordained in Sri Lanka in 2003 was put in prison upon her return to Myanmar. She spent 76 days in jail with poor physical condition, and finally was set free on one condition that she must sign a paper confirming that she is not a bhikkhuni. She was driven to the airport and flew to Sri Lanka where she now continues her study in Ph.D. In 2004 when I approach a Vice Chancellor of one Buddhist Institute in Sagaing, I was waved out saying “there is no such thing as Theravada bhikkhuni’”. The attitude of the Burmese monks seems to focus on Theravada than Buddhism. I must also say among these strong and powerful sangha in Myanmar, another vice chancellor of the same institute who has his degree from abroad, he was also a head of a meditation center, he expressed entirely different attitude to bhikkhuni issue. He was much more friendly and offered warm welcome to foreign visitor though she might be a bhikkhuni. The fact that Myanmar monks are strong in their character, the educated ones are among them and they are the strength to carry out Buddhism in the true spirit of Buddhism. There is always hope even in the dark cave if Buddhism is practiced, and if we believe that we are sharing the same responsibility and same spiritual goal. Sri Lanka stands out with its unique historical background. It is the first country that Buddhist missionary went to during the time of King Asoka the great in 3rd C.B.C. the royal families of the two countries already established a friendly relationship before the missionary work. For this reason, it was Mahinda, the King’s son who headed the missionary to Sri Lanka. It was upon the request of Princess Anula, King Tissa’s sister-in-law who expressed her interest to lead monastic lifestyle. Prince Mahinda Thera suggested to King Tissa that he should send a royal envoy back to India to request the King to send Princess Sanghamitta there with the necessary chapter of bhikkhunis to give ordination to Princess Anula and her retinue. This was done, King Asoka not only sent Princess Sanghamitta Theri along with 18 bhikkhunis (the details were given in Dipavamsa , the Sri lanka chronicle in the 4th C.A.D.) but also the bodhi sapling as a gift to Sri Lanka. The event of the arrival of Sanghamitta Theri was primarily to give ordination to bhikkhunis, but often glossed over and emphasized more on the arrival of the bodhi sapling. Inspite of the fact that the bodhi sapling was brought to Sri lanka by bhikkhunis, but now it is under the custody of monks. Women or even bhikkhunis are not allowed to enter the sanctuary. This is true also with the tooth relics brought to Sri Lanka by Princess Hemamala, and now women are not allowed to come close to it. The establishment of bhikkhuni sangha in Sri Lanka is the first necessary connecting link to other countries and literally to the outside world. In 433 A.D.2 a group of Sri Lanka bhikkhunis went to China, headed by the chief bhikkhuni whose name was Devasara. They gave ordination to 300 women at the Southern Forest in Nanking. This formed the nucleus of the following bhikkhuni sangha in China and later on Korea. The record of outstanding Chinese bhikkhunis3 can be seen in their biography written by a Chinese monk, Bhikshu Pao Chang a scholar who recorded biography of 65 leading Chinese bhikkhunis who lived between 326 A.D.-457 A.D. While the Chinese lineage of bhikkhunis exist up to present, their strong hold is now in Taiwan where bhikkhunis outnumber bhikkhus. The revival of Buddhism in this country has been mostly the work of bhikkhunis. Meanwhile in 1017 A.D. both the bhikkhu and bhikkhuni Sangha in Sri Lanka came to a dark period with the invasion and occupation of a Hindu Jola King for approximately 50 years. The bhikkhu lineage was revived again and again from Burma and Thailand but not the bhikkhuni lineage as it did not exist in the said countries. The largest and strongest sangha in Sri lanka now is the Syamvamsa revived in 1753 from Thailand as the name suggested. The others being Amarapura and Ramanna both from Burma. It was in 1905 when Catherine de Alwis, daughter of a missionary, who embraced Buddhism and brought back with her the silmata ordination from Burma. Locally she was supported by Lady Blake, wife of the then British Governor. Since then silmata or Silmaniyo (the 10-precept nuns) came into existence. Yet they are not considered ordained, not even samaneri, the lower ordination. Even though they observe precepts similar to samaneris only without the formal pronouncement of pabbajja ordination, technically they are not considered ordained, and thus not part of the sangha. In the whole island the silmatas would number approximately 2500. In 1988 eleven of them with sponsorship from the organizers, went for bhikkhuni ordination in LA, USA. However, upon arrival, they hesitated with fear, and only five of them went through the full ordination. This first group of bhikkhunis were not educated, were not prepared, and did not have any structural support, they dispersed into the wave of the existing silmatas upon their return to Sri lanka. Some of them came forward to be reordained again when ordination was offered in Sri Lanka itself since 1998. In 1993 Sakyadhita, an International Buddhist Women Association convened the international conference4 with the author holding a position of the president of the Association. Even though the organizing members were told not to have discussion on bhikkhunis in the conference agenda but more than a hundred of bhikkhunis from 26 countries participated at that conference. At the opening ceremony, the President and at least 3 ministers from the ministries of education, Buddhasasana and Foreign Affairs were presiding over and giving welcoming speech to the august audience. The message was very effective. The small island became aware of the existence of bhikkhunis elsewhere but not in Sri Lanka inspite of the fact that Sri lanka, historically was the first country to have received the lineage. The second batch of bhikkhuni ordination came in 1996 with the Korean bhikkhu sangha organizing it in Sarnath. There were 10 silmatas who received full ordination. However there were some loopholes, like one of the leading candidates did not spend 2 years as a sikkhamana before taking the full ordination, and that the ordination was not given with the proper dual platform ordination. That is first by the bhikkhuni sangha and later by the bhikkhu sangha. The event was VDO taped, and names of bhikkhus and bhikkhunis were given. It was clear that on the bhikkhuni side there were only 3 of them, not sufficient as a sangha (minimum five is required.) However, the ordination of bhikkhuni became known to the larger public in Sri Lanka for the first time, accepting or not accepting. The third batch, and most effective happened in 1998 when the educated and liberal senior monks in Sri Lanka helped screen 20 most capable silmatas in the island who were ready and applied for full ordination. They were sent to Bodh Gaya for full ordination with at least 10 most senior monks from Sri Lanka as their teachers and mentors. Among these Maha Theras5, the names of some of them will be internationally well known, i.e. Venerable G. Gunaratna Maha Thera (based in Virginia), Venerable Somalankara, Venerable Sumangalo Maha Thero (now Maha Nayaka). Fo Guang Shan was the main sponsor and organizer of the event. But they have researched well in advance and tried their best to make their effort most acceptable. They had invited all the major leading Theravada monks to participate as witnessing acharyas. We have to accept that these Theravada monks who attended the ordination were not all for the ordination. They accepted to participate partly because they were curious to know what was going on, partly for the financial benefit offered, etc. I met few who participated and even with a word of support for the ordination of the bhikkhunis published but really were not supportive. This is true in the case of one senior Cambodian monk and one senior Bangladeshi monk I encountered later. But the significant Sri Lanka monks who participated in the ordination and realized that whether the Sri Lanka monks want to support or not, the women are going ahead with this ordination. After the ordination in Bodh Gaya, they took the newly ordained bhikkhunis to Sarnath and gave them yet another ordination, purely Theravada. This is to strengthen the need of those who wanted to make sure that they are starting a Theravada lineage. And this they did it with the recommendation in the Vinaya, Cullavagga , that the bhikkhu sangha can do it on their own. This is the nucleus of the existing Theravada bhikkhuni sangha in Sri lanka now. Since 1998 Venerable Sumangalo Maha Thera has been organizing annually ordination for bhikkhunis at his Syamvamsa chapter in Dambulla. Out of the 20 newly ordained bhikkhunis, 2 most senior and capable bhikkhunis who had at least 42 years standing as silmatas before their upasampada (bhikkhuni ordination) were chosen and appointed by the sangha to become the upajjhaya (preceptor) on the bhikkhuni side. In South East Asia, Thailand is geographically based in the center, easily accessible from various parts of the world. The movement on bhikkhuni ordination started as early as 1920s but the first attempt by Sara and Chongi, the two sisters was aborted attempt. And in order to make sure that bhikkhuni ordination should not happen in this Buddhist land, the Sangharaja issued an order in 1928 forbidding the Thai monks to give any level of ordination to women. As late as 2003, the sangha still quoted this order for the reason not to consider the ordination for women in Thailand. Because of the long years of unrest in Ayudhya period (1350-1767 A.D.), the monks became very weak in their practice and their spiritual purpose. Dhama Vinaya as laid down by the Buddha should be sufficient for the administration of the good practicing monks became insufficient at the time when Buddhism was on a decline. It was in the Reign of King Rama I (1782) of present dynasty, for the first time the monks have to come under Sangha Act apart from the Dhamma Vinaya of the Buddha. This becomes a strange marriage between the State and Buddhism. The existing Sangha Act6 defines “Sangha as male sangha”, this excludes bhikkhunis automatically. The constitution however, presents a more balanced view of the population, they can practice any religion as they choose and they are allowed by law, to practice any form of religion their choice. However, a bhikkhuni cannot use her “bhikkhuni” title in her ID card simply because there is no computer code for it. Ordination of bhikkhuni took a turn with the appearance of the new millennium. Associate professor Dr.Chatsumarn Kabilsingh, a professor in Buddhism with her thesis on the Study of the Bhikkhuni Patimokkha took early retirement and became first samaneri and bhikkhuni in 2001 and 2003 respectively. She took her lineage from Sri Lanka, and became the first Theravadin bhikkhuni. This was a breakthrough and few women now are walking this path. There are already at least 8 samaneris waiting for full ordination in Thailand. Of course they have to seek ordination in Sri Lanka in order to form the first batch sufficient to form a sangha at a later stage. As recent as Feb.2, there were 13 maejis who went to Sri Lanka to receive samaneri ordination and just return to continue to propagate Buddhism in the northern part of Thailand. This is yet another promising group of capable nuns. The spear-headed group of bhikkhunis have to walk a tight robe to find their own spiritual root and slowly win over the support of the populace. It seems the Buddha was right when he prophesied that the decline of Buddhism will happen when the four groups of Buddhists do not respect the Buddha, the Dhamma, the Sangha, and when they do not respect each other. The Thai bhikkhuni sangha at this early stage will have to depend on the support from their ordination lineage from Sri Lanka. It will be a while before the Thai bhikkhuni sangha can find their own root in Thailand. I would like to focus on the possible link between Thailand and Tibet with an attempt to revive the bhikkhuni sangha to fulfill the four groups of the Buddhist as intended by the Buddha. Culturally there is a vast field to iron out the myths against women in general and against ordination of women in particular. Deconstruction of myths can be applied in both countries as an immediate tool to bring about the right soil to cultivate the idea of Buddhism for men and women equally. The technique to deconstruct could take the help of Feminist theory and Liberal Theology as tools to go back and study the original texts in both Theravada and Tibetan tradition and reread it with a new light in order to bring about a more positive energy to uplift Buddhism from the unnecessary patriarchal wrapping. Sharing of the training in the two countries actually have already begun at NGO levels, and private levels. But if it is supported and organized at a national level it will be even more effective. Tibetan samaneris from Ladakh have been attending 3-month training programs sponsored in Thailand in these recent years. At other times, Buddhist NGOs from Thailand have been coming over to Ladakh to train Tibetan nuns and laywomen. This is a very positive co-operation. Conferences have been conducted in the past, but what is immediately needed is more of the know-how technology and extending assisting hands in various shared concerned projects. Another project that could start off immediately is a small but committed joint research project to see how each can help promote each other in bringing about the more accepted version of the revival of bhikkhuni sangha. These suggestions would help to open up the door locked for Buddhist women in some countries for a long time. Of course the immediate benefit would be for the women, but in the long run it is a true reflection of the right understanding of Buddhism, a reverential respect to the Buddha who established and gave this heritage to women to continue to preserve and nurture Buddhism with equal responsibility. It is with the hope of bringing to attention for this august gathering that the true heritage of Buddhism women as the daughters of the Buddha would soon be effective.